Voltage Regulation of Synchronous Machine (Alternator) by E.M.F Method or Synchronous Impedance Method. In this post we are going to learn how to calculate voltage regulation of synchronous machine by EMF method or synchronous impedance method. 1. Per phase resistance of armature Ra. 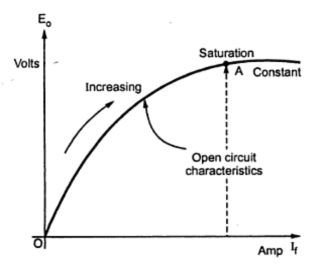 2.Graph of open circuit characteristics which is drawn between open circuit voltage and field current. This can be obtained by conducting open circuit test on the alternator. 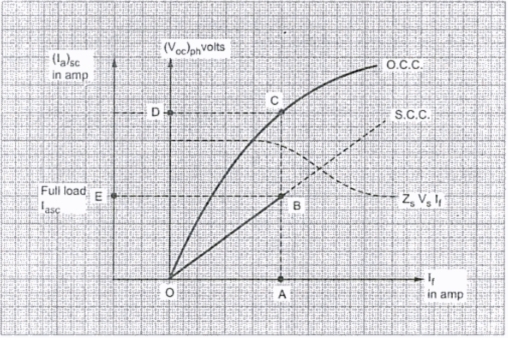 3.Graph of short circuit characteristics which is drawn between short circuit voltage and field current. This can be obtained by conducting short circuit test on the alternator. Let's see how open circuit test on synchronous machine is done. 2. Armature is connected to TPST switch terminals on one side the terminals of TPST switch on other side are short circuited with the help of ammeter. 3. An alternator is coupled to the prime mover which can drive the alternator at synchronous speed. 4. A voltmeter is connected across the lines to measure the open circuit voltage of alternator. 5. 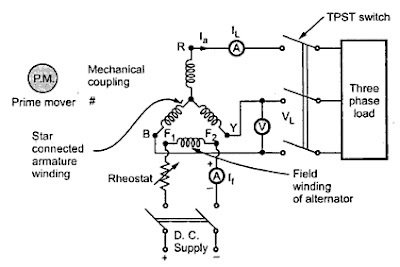 A rheostat is connected in series with the field winding. 6. Field winding is excited by using D.C supply and flux is adjusted by adjusting the rheostat. Flux adjustment is nothing but adjust the current flow through field winding. 1. By adjusting the prime mover make the synchronous machine to run at synchronous speed. 2.Now rheostat in the field circuit is kept at maximum position and switch on dc supply. 3. Now keep TPST switch in the open position. 4. Now by adjusting the rheostat field current is changed from minimum to maximum and the corresponding values of open circuit voltage is noted down. This is called open circuit characteristics of synchronous machine which is obtained by conducting open circuit test on synchronous machine. Let's see how short circuit test on synchronous machine is done. 2.Now rheostat in the field circuit is kept at maximum position and switch on dc supply so field current will have minimum value. 3.Now close the TPST switch as the ammeter has negligible resistance armature will be short circuited. 4.Adjust the field excitation until full load current is obtained through the ammeter connected to armature circuit. 5. 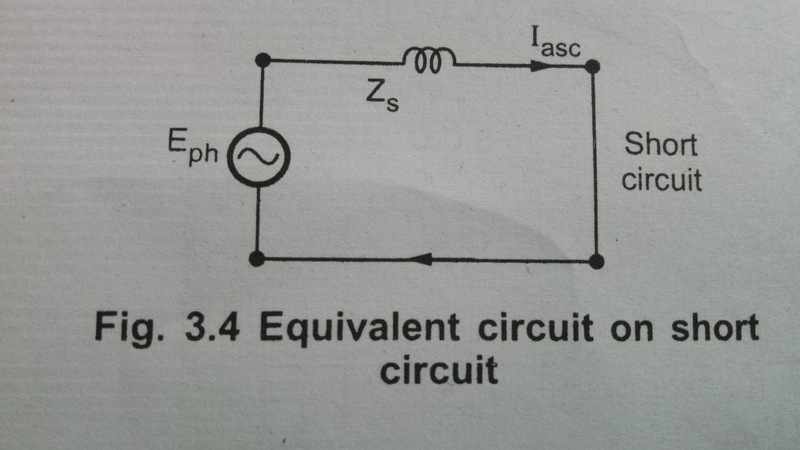 Note down short circuited armature current value for different values of field current. By using above table draw the graph between Iasc against If. The above graph is called short circuit characteristics of synchronous machine and is obtained by conducting short circuit test on synchronous machine. This curve resembles a B-H curve of a magnetic material. Now let's calculate synchronous impedance of synchronous machine. 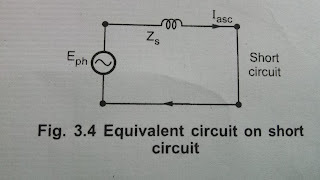 2.So short circuit armature current flows through the impedance Zs. 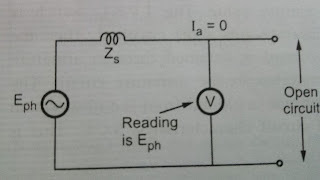 3. voltage responsible for this short circuit current to flow is emf which is induced internally. Zs = Eph / Iasc. 1. If is kept same as before in the short circuit test. 2. Now terminals of the synchronous machine is removed. 3. As If is same internally induced E.M.F will be same but current will be zero. 4. 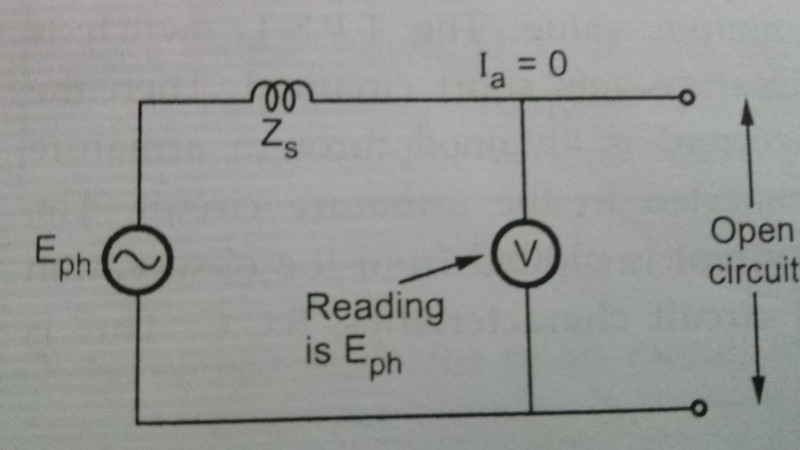 Now ammeter gives zero reading but voltmeter gives the open circuit e.m.f which is equal to internally induced e.m.f. Now Eph = (Voc)ph since open circuit. In this way we can calculate Zs from open circuit characteristics of synchronous machine and short circuit characteristics of synchronous machine. As Zs is different for different values of If we can calculate it from graph of open circuit characteristics of synchronous machine and short circuit characteristics of synchronous machine. 1. From short circuit characteristics of synchronous machine determine If required to drive full load short circuit current. 2. From the same If value draw a line such that it touches both open circuit characteristics of synchronous machine and short circuit characteristics of synchronous machine. 3. Now extend this line on to Y-axis which gives open circuit voltage and short circuit current. Zs = (Voc)phase / (Iasc)phase where If is constant and If is at Isc = Irated. It can also be calculated for different load conditions the process is same but Isc may not be equal to rated for the corresponding If. Now let's calculate voltage regulation of synchronous machine by E.M.F method or synchronous impedance method. Few requirements are there to calculate voltage regulation of synchronous machine by E.M.F method or synchronous impedance method. 2. synchronous impedance Zs which we have calculated in the before steps. For lagging power factor we use positive sign and for leading power factor we use negative sign. Value of Eph is calculated from above expression. So we have determined voltage regulation of synchronous machine by E.M.F method or synchronous impedance method. 2. Total actual load need not to be connected for determining voltage regulation of synchronous machine by E.M.F method or synchronous impedance method. Here we have considered drop due to armature reaction as additional leakage reactance this method gives large values of synchronous reactance. This gives large values of percentage voltage regulation than actual value. This method is also called Pessimistic method. Today in this post we are going to learn what is Voltage regulation of synchronous machine and different methods to calculate Voltage regulation of synchronous machine. Voltage Regulation of synchronous machine is defined as the difference between terminal voltage at no load and terminal voltage at full load and excitation , speed must remain same.Voltage Regulation of synchronous machine is generally calculated in percentage of full load terminal voltage. 1. Parallel operation of alternators is affected by the voltage regulation. By calculating voltage regulation of synchronous machine we can adjust the parallel operating machines to be in synchronism. 2. Calculating voltage regulation of a synchronous machine determines the type of automatic voltage control equipment required for resisting the voltage changes. 3.When the load is thrown off voltage rise must be known because with the rise in voltage the insulation must be able to withstand this rise. So calculation of voltage regulation of synchronous machine has a great importance. Let E be the terminal voltage of the synchronous machine at no load. Now if the synchronous machine is given full load the terminal voltage will no longer be E because of the losses so let the terminal voltage now be V.
There are two types of methods for calculating voltage regulation of synchronous machine. 1. Direct load test method. 1.EMF method or Synchronous impedance method. 2. MMF method or Ampere turn method. 3.Zero power factor method or potier method. 2. Armature which is star connected is connected to the three phase load with the help of TPST. TPST is a switch and it means triple pole single through. 3. 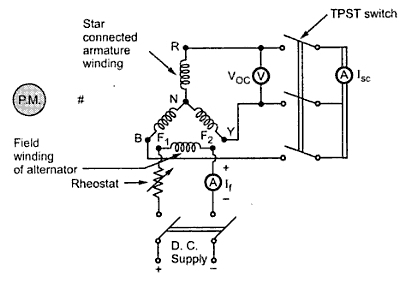 A rheostat is connected in series with the field winding. 4. Field winding is excited by using D.C supply and flux is adjusted by adjusting the rheostat. Flux adjustment is nothing but adjust the current flow through field winding. 1. Adjust the prime mover such that the alternator rotates at synchronous speed Ns. 2. Now DC supply is given to the field winding and the current flow through field is adjusted so that the flux is adjusted such that the rated voltage is obtained at its terminals which can be seen on the voltmeter connected across the lines. 3. Now load is connected to alternator with the help of TPST switch. 4.The load is then increased such that the ammeter reads rated current. This is full load condition of alternator. Now as load is connected due to armature reaction there is loss in voltage so let the induced voltage be V.
5.Now again adjust the rheostat of the field winding to get rated voltage at alternator terminals. 6.Now remove the load by opening TPST switch and the excitation , speed should not be changed it should be same as before removing the load. 7. As there is no load there is no armature reaction the induced emf is equal to terminal voltage which is E.
Voltage regulation% =( E - V / V) × 100 at a specific power factor. This method is applicable only for small capacity machines for larger capacity machines it is not economical because that much load cannot be given directly. In this way we have calculated the voltage regulation of synchronous machine by direct load test method. For larger capacity machines voltage regulation can be calculated by Indirect method. In the next post we can see how to calculate voltage regulation of synchronous machine by Indirect method. We know Synchronous Machines generates E.M.F.the amount of EMF generated can be calculated using below simple derivation. Time taken for one revolution = 60/Ns seconds. 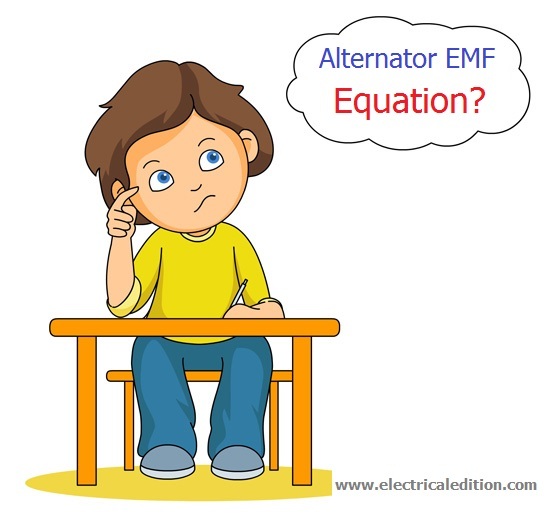 This is the general emf equation for the machine having concentrated and full pitched winding.In practice, alternators will have short pitched winding and hence coil span will not be 180o(degrees), but on or two slots short than the full pitch. Kc or KP = Cos α/2 . This is pitch factor. 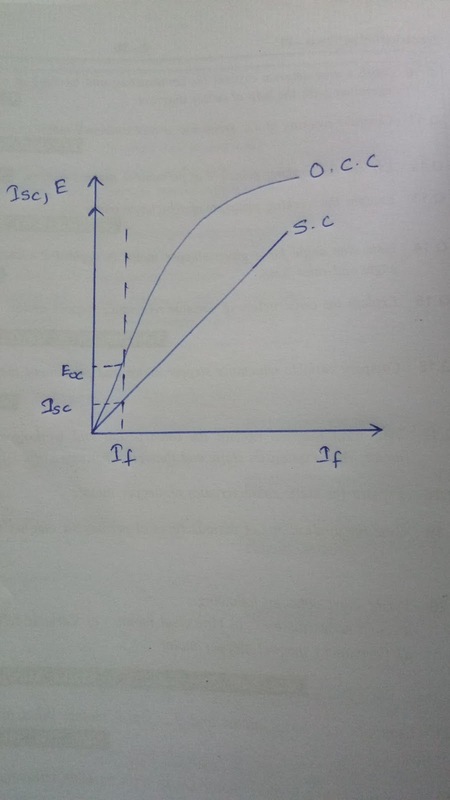 This is the actual available voltage equation of an alternator per phase.If alternator or AC Generator is Star Connected as usually the case, then the Line Voltage is √3 times the phase voltage. 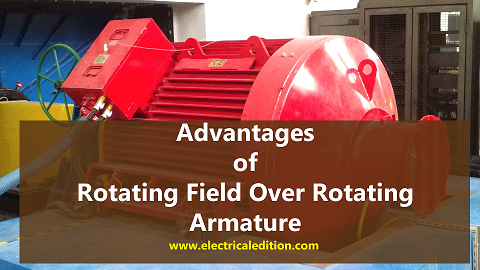 In this article we are going discuss about why rotating field is used over rotating armature in alternators or synchronous machine.In the alternator construction we said in large AC generators we use stationary armature and rotating field.There are some advantages are with stationary armature arrangement want to know what are they? here we go....advantages of stationary armature in synchronous machines. 1) We use AC power in our daily life which has generation level around 11 kV to 33 kV,it is difficult to get induced emf in armature because we can't mount as many as conductors as required on rotating armature hence we prefer stationary armature. 2) As said in above point large conductors posses high centrifugal forces while rotating.So there will be chance of conductors slipping out from slots.So by using rotating field over rotating armature we can reduce mechanical and electrical stresses. 3) The problem of sparking at the slip rings can be avoided by keeping field rotating which is low voltage circuit and high voltage armature as stationary. 4) It is not that much easy to collect larger currents at very high voltages from rotating armature. 4) It is easier to collect larger currents at very high voltages from a stationary member than from the slip ring and brush assembly.The voltage required to be supplied to the field is very low (110 V to 220 V dc.) and hence can be easily supplied with the help of slip ring and brush assembly by keeping it rotating. 5) The ventilation arrangement for high voltage side can be improved if it is kept stationary. 7) As we collect power from armature a rotating field type makes it easier to collect power from the armature,and greater output can be collected at low losses compared to that of rotating armature. 8) If field is rotating, to excite it by an external d.c. supply two slip rings are enough.One each for positive and negative terminals. As against this, in three phase rotating armature the minimum number of slip rings required are three and can not be easily insulated due to high voltage levels. By considering the all above reasons we can say for very high voltages, rotating field type of arrangement in alternators is better than stationary field type. For small voltage rating alternators rotating armature arrangement may be used. Alternator is the machines which generates the power which we are using today.Now let us discuss about construction of alternator or synchronous machine.The most important parts in alternator design are stator & rotor.Modern alternators prefer rotating field type of construction.Unlike d.c. generators in case of alternators construction the winding terminology is different. In alternators the stationary winding is called 'Stator' while the rotating winding is called 'Rotor’. Note: Most of alternator have stator as armature and rotor as field, in general. The stator of synchronous machine is a stationary armature.It consists of a core and the slots to hold the armature winding like the armature of a dc. generator. The stator core of alternator is laminated to reduce eddy current losses.Stator is built up of special steel stampings insulated from each other with varnish or paper.Silicon steel is used as armature core to minimize hysteresis losses. The entire core is fabricated in a frame made of steel plates. The core has slots on its periphery for housing the armature conductors. Frame does not carry any flux and serves as the support to the core.Holes are made in the frame to maintain ventilation.The section of an alternator stator is shown in the Fig. There are two types of rotors used in alternators. Salient pole type of rotor is also called projected pole type as all the poles are projected out from the surface of the rotor.The poles are made up of thick steel and they are laminated. The poles are mounted on the rotor with the help of bolts [shown in the fig]. The pole face has been given a specific shape. The field winding is provided on the pole shoe. Salient pole type rotors have large diameters and small axial lengths. The limiting factor for the size of the rotor is the centrifugal force acting on the rotating member of the machine. As mechanical strength of salient pole type is less, this is preferred for low speed alternators ranging from 125 r.p.m. to 500 r.p.m. The prime movers used to drive such rotor are generally water turbines and IC. engines. 1.They have a large horizontal diameter compared to a shorter axial length. 2.The pole shoes covers only about 2/3rd of pole pitch. 3.Poles are laminated to reduce eddy current loss. Smooth Cylindrical Type Rotor is also called non-salient type or non-projected pole type or round rotor construction.The rotor consists of smooth solid steel cylinder, having number of slots to accommodate the field coil. The slots are covered at the top with the help of steel or manganese wedges. The un-slotted portions of the cylinder itself act as the poles. The poles are not projecting out and the surface of the rotor is smooth which maintains uniform air gap between stator and the rotor. These rotors have small diameters and large axial lengths. These rotors have small diameters and large axial lengths.This is to keep peripheral speed within limits.The main advantage of this type is that these are machanically very strong and thus preferred for high speed alternators ranging between 1500 to 3000r.p.m.Such high speed alternators are called 'turbo-alternators'.The prime movers used to drive such type of rotors are generally steam turbines,electric motors. The cylindrical rotor alternators are generally designed for 2-pole type giving very high speed of Ns = (120 × f)/P = (120 × 50) / 2 = 3000 rpm. Tags:alternator construction and working pdfprinciple construction and working of ac generator pdf,alternator working wikipedia pdf,ac generator theory.